But from a philosophical standpoint, shareholder suits have never made much sense to me. While I can understand the shareholders of the company suing a minority shareholder who might be enriching themselves disproportionately (e.g. Rigas family at Adelphia), suits by shareholders against the company they own seem… crazy. Any successful verdict for shareholders against the company would effectively come out of the pockets of the company’s owners who are.. the shareholders. So in effect, shareholders are suing themselves, and, win or lose, they as a group end up with less than if the suit had never been started, since a good chunk of the payout goes to the lawyers. The only way these suits make financial sense (except to the lawyers, like Bill Lerach) is if only a small subset of the shareholders participate, and then these are just vehicles for transferring money from half the shareholders to the other half, or in other words from one wronged party that does not engage in litigation to another wronged party who is aggressively litigious. Is there really justice here? OK, you could argue that many of these shareholders are not suing themselves, because they are past shareholders that dumped their stock at a loss. But given these facts, these suits are even less fair. If these suits are made by past shareholders who held stock (ie, were the owners) at the time certain wrongs were committed, they are in fact paid by current and future shareholders who may well have not even owned the company at the time of the abuses, and who may in fact be participating in cleaning the company up. So these litigants are in effect making the argument that because the company was run unethically when they owned it, they are going to sue the people who bought it from them and cleaned it up? Shouldn’t the payment be the other way around, with past owners paying current owners for the mess they left? A federal appeals court on Wednesday put the kibosh on a shareholder antitrust suit against the board members of Sears Holding Corp, finding that the suit only served to enrich the plaintiffs' lawyers. The ruling from the Chicago-based U.S. Court of Appeals for the 7th Circuit marks the latest victory for Ted Frank, of the Center for Class Action Fairness, who argued that the suit was an abuse of the legal system and conferred no benefit on Sears shareholders at large. The 7th Circuit agreed. "The only goal of this suit appears to be fees for the plaintiffs' lawyers," Judge Frank Easterbrook wrote for a unanimous three-judge panel. Several law firms, including Vianale & Vianale, filed the proposed class action on behalf of two named investors in 2009. The derivative suit accused two Sears directors of holding positions on the boards of several competing companies, in violation of federal antitrust law. Given the high cost of litigating an antitrust suit, Sears reached a settlement with the investor plaintiffs, agreeing to get rid of one of the directors and pay $925,000 to the investors' attorneys. Frank, who specializes in challenging class action settlements, argued that the resolution was a raw deal for Sears shareholders, costing them legal fees and a director they had recently re-elected. The deal also would not prevent someone else from filing a copycat suit, given that one of the two targeted directors would remain on the Sears board. What's more, the problem of interlocking boards is usually resolved when the Department of Justice or the Federal Trade Commission asks a company to fix the violation. Frank, himself a Sears shareholder, asked to intervene in the case to block the settlement, but the Illinois district court refused, finding that the plaintiff investors adequately represented the interests of Frank and the other shareholders. On appeal, the 7th Circuit panel reached the opposite conclusion, finding the interests to be "entirely incompatible." The panel sent the case back to the district court, with instructions to allow Frank to intervene and to rule in favor of the Sears defendants. "The suit serves no goal other than to move money from the corporate treasury to the attorneys' coffers, while depriving Sears of directors whom its investors freely elected," Easterbrook wrote. Most of you likely remember the state settlements with tobacco companies. The settlements were set up to pay states a percentage of future tobacco company earnings and sales. But just like a profligate homeowner borrowing against his paper equity in his home after housing prices increased, governments wanted to spend the money NOW, not over 20 years. So they borrowed against future settlement payments. Except that now, given lower smoking rates (incentives work) the settlement payments are less than they were forecast, and states must find a way to make up the difference and pay their creditors. Big tobacco was supposed to come under harsh punishment for decades of deception when it acceded to a tort settlement seven years ago. Philip Morris, R.J.Reynolds, Lorillard and Brown & Williamson agreed to pay 46 states $206 billion over 25 years. This was their punishment for burying evidence of cigarettes' health risks. But the much-maligned tobacco giants have subtly and shrewdly turned their penance into a windfall. Using that tort settlement, the big brands have hampered tiny cut-rate rivals and raised prices with near impunity. Since the case was settled, the big four have nearly doubled wholesale cigarette prices from a national average of $1.25 a pack (not counting excise taxes) in 1998 to $2.10 now. And they have a potent partner in this scheme: state governments, which have become addicted to tort-settlement payments, now running at $6 billion a year. A key feature of the Big Tobacco-and-state-government cartel: rules that levy tort-settlement costs on upstart cigarette companies, companies that were not even in existence when the tort was being committed. The government has found over time that it is able to sell higher taxes to the voters on certain items if they can portray those items as representing some socially unwanted behavior. These are often called "sin" taxes. The justification for the tax in its beginning is as much about behavior control as revenue generation. Taxes on cigarettes, alcoholic beverages and even gasoline and plastic grocery bags have all been justified in part by the logic that higher taxes will reduce consumption. However, a funny thing happens on the way to the treasury. Over time, government becomes dependent on the revenue from these taxes. The government begins to suffer when the taxes have their original effect — ie reducing consumption — because then tax revenues drop. The government ultimately finds itself in the odd position of resisting consumption drops or restructuring the tax so it no longer incentivizes reduced consumption so that it can protect its tax revenue collections. U.S. Treasury Secretary Timothy Geithner told Congress he would start tapping into federal pension funds on Monday to free up borrowing capacity as the nation hits the $14.294 trillion legal limit on its debt. The U.S. Treasury will issue $72 billion in bonds and notes on Monday, pushing the nation right up against its borrowing cap at some point during the day, according to a Treasury official. Geithner said he would suspend investments in two government retirement funds, which will give the U.S. Treasury $147 billion in additional borrowing capacity. Why does this surprise anyone? Up to this point, government workers have enjoyed a special privilege. All other Americans have had their retirement accounts in the Social Security system raided and replaced with IOU's, such that $0 actually still exists in these accounts. All this does is subject government worker's pensions to the same treatment. It is in fact telling that government employees have been a protected class on this dimension for so long. I am sure these funds will be quickly replaced. No such luck for folks counting on Social Security for their retirement. Repeat after me: There is nothing wrong, immoral, evil, or even unsavory about short-selling. No one gets mad at you for selling an over-valued security which you actually own, so there should be no ethical difference in selling an over-valued security you don't actually own. Somehow people who are traditionally long in the market (e.g. corporate executives) have convinced the world that short-sellers should be vilified. I don't understand it. If you love the stock and short-sellers drive it down, you should treat it as a gift that the stock you love can now be bought more cheaply. On Oct. 8 and 9, 2008"”as the Federal Reserve was bailing out American International Group Inc."”an account Sen. Isakson held invested more than $30,000 in ProShares UltraShort 7-10 Year Treasury and UltraShort 20+ Year Treasury, the records show. These are "leveraged short" funds, designed to gain $2 for each $1 drop in the daily value of U.S. Treasury bonds. Isakson claims he was not actively managing the account, a claim that is probably true given the ethics rules in Congress (not that anyone follows those). My response in his place would have been, "F*cking-A right I was shorting government bonds. Haven't you been paying attention over the last 12 months?" In February, Sen. Johnny Isakson (R., Ga.) argued on the Senate floor that "we don't need those speculating in the marketplace to take unfair advantage of the values of equities that are owned by Americans all over this country for the sake of making a buck on a short sale." Again this unaccountable bias that somehow people who are long are morally superior, and somehow more entitled, than people who are short. Every year, the government forced nearly every working American to give it an interest-free loan. Each person pays his taxes (via legally required withholding) as much as 16 months early, with not a cent of interest from the government for this loan of funds. Several states have been toying of late (and California actually implemented) schemes in which the required withholding rates are jacked far above any conceivable level of tax liability. These are desperate financing approaches from entities who are no longer able to borrow (or afford the interest of) money at arms length, and so much use the coercive power of the government to force its citizens to fork over interest free loans. The U.S. Treasury and Labor Departments will ask for public comment as soon as next week on ways to promote the conversion of 401(k) savings and Individual Retirement Accounts into annuities or other steady payment streams, according to Assistant Labor Secretary Phyllis C. Borzi and Deputy Assistant Treasury Secretary Mark Iwry, who are spearheading the effort. There literally isn't enough money in the world to float the T-notes the Treasury must issue in order to prop up our unsustainable spending path. There are, however, about $3.6 trillion in funds just sitting in 401(k) accounts. If the government can urge"“or force"“you to convert your 401(k) into T-note funded annuities, the Treasury can continue to issue those notes to float the government's deficit. Essentially, you'll be converting your retirement funds into an IOU from the government"¦just like your social security account has already done. The normal process for bureaucratic allocation of, say, highway funds, does not always work that well. Seriously, you don't have to convince this libertarian of that. But it is at least intended to try to balance priorities and allocate the funds marginally rationally. Which points out the problem with earmarks -- they are overrides by Congress of the normal allocation and prioritization process for political ends. By definition, the projects in earmarks would not have normally been funded by the usual operation of the prioritization process. Which brings me, oddly enough, to AIG (and to GM). When companies can no longer meet all of their obligations, they generally file for chapter 11 bankruptcy. This is an extremely well-worn process, both in the courts and the business community, that attempts to save as much value as possible and to allocate that value, based on law and a set of rules everyone understands in advance, to the various stakeholders. The folks who are involved in this process are pretty hard-headed folks, less out for revenge and retribution as for maintaining value and capturing as much as possible for whatever group one might represent. Now Congress and the Administration are getting themselves involved in the bankruptcy process, by trying to avert actual chapter 11 filings by AIG and GM. By doing so, they are effectively overriding the bankruptcy process. Just as with earmarking, they claim this override is for some good of the country. But, just as with earmarking, you can assume it is to benefit some politically-favored group. At GM, the feds are saying that we don't want employees or the equity holders to take a haircut, as they would in Chapter 11, so we will transfer the loss to taxpayers, and perhaps bondholders (could there be any politically less favored group than taxpayers?). Same at AIG. Is it any surprise that the number one beneficiary of the Pauslon bailout of AIG was Goldman Sachs? The Left thought they smelled a rat when the administrations contracted with ex-Cheney-run Haliburton in Iraq, but no one is going to bat an eye when the Treasury department, populated with ex-Wall Street types, is bailing out all its employees' old firms? On the subject de jour, the AIG executive bonuses, many of these were just as guaranteed, contractually, as were payments on AIG policies and bond guarantees. I don't know how such obligations are treated in chapter 11 (are they treated as more or less senior than other obligations?) but I do know the decision to keep them or ditch them would be made against a goal of maintaining long-term value, and not public witch-hunting. This is the real problem, even beyond the taxpayer cost, of this new form of Congressional or Administration-led pseudo-bankruptcy: Winners and losers are determined by political power and perceptions of short-term political gain, rather than against a goal of maintaining value and following well understood and predictable rule. This process throws all the old predictable rules and traditions out the window. Investors and folks with contracts used to know just how senior their obligations were in a corporate failure. Now, they have no idea, as their position in the bankruptcy may in the future depend more on how much they donated in the last presidential election, or how good their PR agent is. So If It's All About the TED Spread, Should We Be Worried? Us non-financial types are always learning something new. After a lifetime of thinking that our economy rests on free markets, entrepreneurship, an educated and flexible labor force, risk-taking, etc., we suddenly find that everything depends on the TED Spread, a metric most of which most of us were blissfully ignorant 2 months ago. 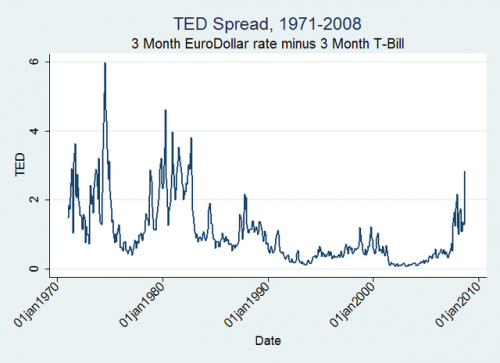 The TED spread is basically the difference or spread between short term inter-bank loan rates and short term treasuries or T-bills. It is in some sense a measure of perceived risk of lending to banks vs. (what are considered) low or near-zero risk US treasury obligations. One way to think about it in the current market is how much extra would you need in interest to lend to your slacker brother-in-law Earl vs. say to Bill Gates. Now, the period from 1970-1983 were not by any means an economic glory period, but on the other hand its clear that TED spreads of the order of magnitude we have seen in the past weeks are not unprecedented by any means. 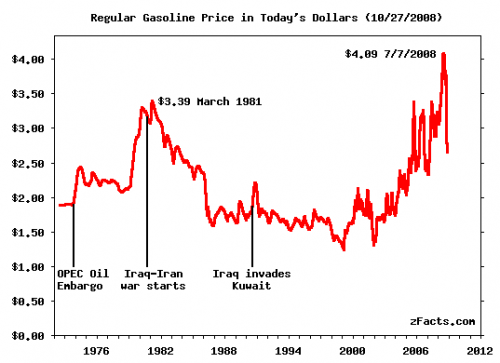 So, gasoline prices rocketed from $1.50 a gallon to over $4.00 a gallon. Does this mean that gasoline purchases have stopped? Has the gasoline market closed up shop? Of course not. It just means the price went up. It is absurd to show me a price chart, which is what the TED spread graph is, and infer from it changes in the underlying transaction volume. How Much Authority Are We Proposing to Give the Treasury? to set up such an insurance plan without congressional authorization. From what he said, it struck me that both courses could be followed. requests one or the other. Jeez, how much latitude are they asking for? Is the bill really so broad that the secretary of the treasury could set up an entirely new government insurance program for financial assets without further Congressional approval? While I think Cantor is being overly-optimistic about the near-term cash flow of his insurance proposal, it does seem to be at least an incremental improvement over Paulson's plan. Category: Government | Comments Off on How Much Authority Are We Proposing to Give the Treasury? much-needed 21st-century civil rights act for stupid people." Main Street "” who got us to where we are today. We must guarantee that no American suffers the soft bigotry of being forced to live with the consequences of his bad decisions." threatened, and we must act to preserve it." firms that made prudent investment decisions during the past 15 years." I would blog on the most recent bank bailout, but I don't really understand what the proposal is. The administration apparently wants to take $700 billion and ... do something with it. Frankly, I would prefer them to just let the banks totter over and spend the money, if they really feel it necessary, to clean debris up afterward, as they did with the RTC in the 1980s. At least that way we would avoid the moral hazard and know the money was going to cleaning up the worst messes. My guess is that $700 billion pseudo-randomly injected into whatever companies can cry the loudest at the treasury's door is not only creating bad incentives, but is probably going to waste at least half of the money. what safe investments like treasury bonds provide today. Part of a great article by Steven Malanga on the growing power of public sector unions. He tells some pretty amazing tales of self-dealing by government officials on a massive scale. Russia the expenses are nationalized and the revenues are privatized. time to take Mr. Putin off the list. Bank of America set a new record today. It sent me the terms and conditions on their treasury services -- 48(!) full 8-1/2 by 11 inch pages with 10-point font. Unbelieveable.